When I would come home from school, my mom would often tell me to walk the dog. This used to bother me because I hate even the most mundane exercise, but then something changed. In my senior year of high school, I started to walk the dog more often, sometimes without my mom even having to ask. Unfortunately, my new love of dog-walking had a darker side; it became part of my routine for taking the painkiller Vicodin. Hydrocodone (the active ingredient in Vicodin) is a semi-synthetic opioid, similar to morphine. Morphine comes from the opium poppy, a plant used for decorations, bagel seasoning and heroin production, among other things. After taking Vicodin and leashing up the dog, I would hike through the hills of my native Oregon. About half an hour into the walk, my worries of the day would begin to fade, and a sense of relaxation would overcome me. At that stage in my addiction, the pills did not impair me; in fact they helped me navigate my daily life with more ease and greater joy. My affair with opioid painkillers (not to be confused with over-the-counter ibuprofen or Tylenol) started with a headache. Earlier in the school year, I had come home one day with a throbbing headache. I drank some water, and when that did not work, I took an aspirin. A few hours later, my head was still pounding. Out of desperation, I went into my mom’s purse and took one of her Vicodins. At the time, I did not know how dangerous Vicodin is. I thought it was just a super strong Tylenol. My mom was recovering from surgery and had been prescribed the drug. Ironically, my grandmother, who had come from Los Angeles to take care of my mom, broke her collarbone on the flight up and left the hospital with her own 90-pill prescription. Both my mom and grandmother hated taking painkillers; this left an abundant supply for me. When I took my first Vicodin, I was stage managing a school production involving 300 people. It was a terrific but stressful job; the Vicodin not only took away my headache but freed me from my worries. A critical point is that my addiction could have been avoided if physicians had been more aware of the dangers of opioids at the time. Had that been the case, my mom and grandmother wouldn’t have been prescribed enormous quantities of opioids. Had there been safer prescribing practices in place, perhaps my addiction would never have started. After that first pill, I did not take another one for a few days. Slowly, I began to develop excuses to use them—if my mom wasn’t going to take them, why should they go to waste? I developed a tolerance after a few weeks and started taking two pills to get high. Being high on painkillers isn’t like being high on other drugs. I could still function, attend school and go about my life, but everything just felt better. Nothing bothered me. I felt confident, and a warm sensation enveloped my body. At the time, I did not consider myself to be abusing drugs, and I was oblivious to this destructive pattern. As time passed, I began to get careless. After months of a constant opioid buzz, I forgot what it felt like to be sober. Vicodin began to make me aggressive, and I started to yell more often at the actors and crew I managed at work. I stopped caring about everything, and my A in chemistry plunged to a dangerous C-. At home, my parents seemed none the wiser about my habit, and I took extraordinary steps to hide my pill-popping. The gravy train came to an end when the pills ran out six months later. 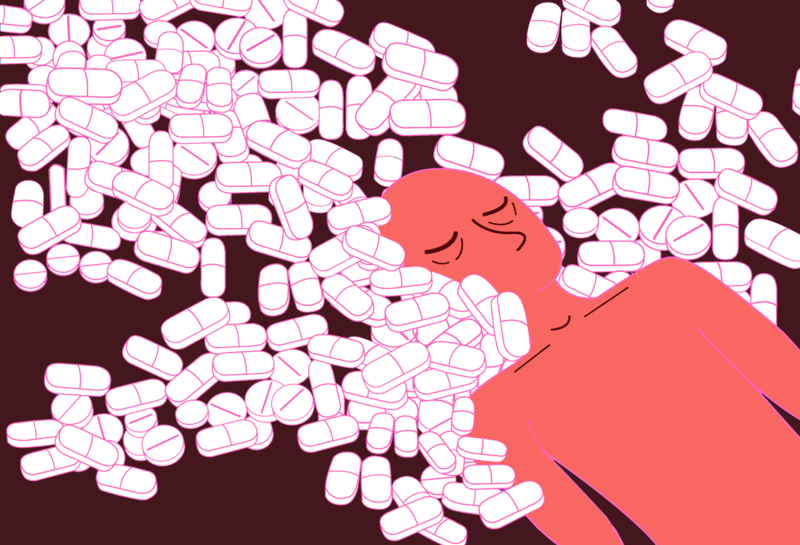 Taking the last pill in the bottle felt like a sacred event—the end of a relationship I believed I could handle on my own. Within hours, I had called my mom who was in Albuquerque. We got in an argument, and I blurted out that I had used all of her painkillers and needed help because I felt terrible. She started sobbing and flew home the next day. My parents helped me access the resources and treatment I needed. Growing up, I never suffered from any serious mental health issues, but following my opioid use, I turned into a depressed, anxious mess. There were medications to treat my ailments, but they could only do so much. My first moments of sobriety were difficult as I mourned the end of my relationship with Vicodin. The drug turned the most mundane moments into extraordinary ones. Losing that perpetual excitement took months to get used to, and to this day, I miss the months I spent in artificial bliss. No one wakes up one morning and decides they want to become addicted to drugs. Stealing drugs or causing my family heartache horrifies me. Opioids had an amazing capacity to mute my moral compass. Getting high no longer became something to relieve stress, but rather a necessity to remain functional and have the ability to experience happiness. Once this emotional shield began to fade, things that used to bother me enraged me; moments that hurt me devastated me and life felt like a mission without a goal. In learning how to live without opioids, I had my “aha” moment. Most users are not lazy; they’re not failures or junkies—they are just like you and me. Often, they are just more sensitive or perhaps suffer from a mental illness. Unfortunately, the stigma against those who suffer from substance abuse remains static with little to no improvement in public compassion. It took becoming addicted for me to realize it’s time we must shift our mentality and try to help instead of judge. Although I chose to tell my story anonymously, I hope a day will come when someone can write an article like this without hesitating to reveal who they are. Those who fight daily to stay sober ought to be celebrated as the warriors they are.